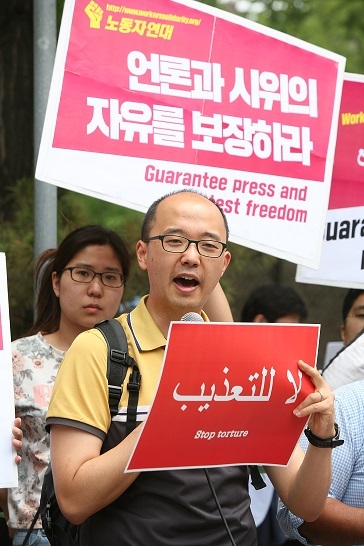 On 19 June, 18 organisations that represent the Korean movement, including the Korean Confederation of Trade Unions (KCTU), National Union of Mediaworkers and Workers’ Solidarity, organized a protest near Egyptian embassy in Seoul. About 20 people demonstrated against El-Sisi regime’s repression on political prisoners. We had speeches and shouted Korean slogans. The speakers condemned the el-Sisi government for its repression against the political prisoners and demanded to release them and to withdraw all the death sentences. We also condemned the hypocrisy of the leaders of other countries such as US, UK and Korea. For example Korean president recently wrote a letter to Sisi saying that she wanted friendship and trust with him. But we made our voice clear that many Koreans do not consider Sisi as our friend but rather a butcher, an enemy of the Egyptian revolution. After the protest Korean delegations tried to reach Egyptian embassy to deliver the letter of protest. But the Korean police blocked us from reaching the embassy. The police insisted that we should drop all of our signs before getting closer to the embassy. We refused, and had some arguments with the police. In the end, a man from embassy came to the protest site, received the letter and went back in. Protesters shouted slogans against him. 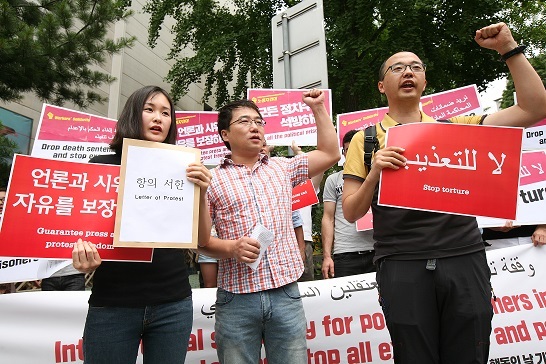 The protest was covered by Al Jazeera, European Pressphoto Agency and Korean media. Drop all the death sentences and stop all executions! Release all political prisoners and guarantee freedom of protest and press! Fair trial for all the prisoners and stop police torture! 2011 Egypt revolution encouraged struggle throughout the world. It gave the message “If Egyptians can bring down the tyranny, we can also fight and win against our boss and rulers” to Korean workers and people. 4 years have passed and now workers and people of Egypt are suffering under military government which is led by the former general Abdel Fattah el-Sisi. On July, 2013 El-Sisi brought down the president Mohamed Morsi and killed more than 3 thousand people who opposed his coup. On behalf of ruling class who want brutal counter-revolution, El-Sisi became president of Egypt in the following year. Hundreds have been sentenced to death under El-Sisi’s military regime and about 90 Egyptian citizens were tortured to death in police stations. More than 40,000 were arrested within a year and many of them were arrested under the draconian anti-protest law. Dozens of journalist also have been jailed because of their writing or their work. This truly violates most basic democratic rights of freedom of protest and freedom of press. Many of the prisoners are also deprived of fair trial. The trial merely acts as a cover for repression and many lacked even the most basic elements of trial. For instance, when the court passed death sentence against over a hundred people along with the former president Morsi on 16 May, it even included the two people who were already dead and one who had been in jail or the past 19 years. El-Sisi’s military regime suppresses not only the Muslim Brotherhood members and its supporters but also revolutionaries who fought against Morsi government for the revolutionary cause. Indeed, Mahienour el-Masry, who is a member of Revolutionary Socialists (RS) and the winner of “Ludovic-Trarieux” Human Rights Prize in 2014, has led movement against Mubarak and Morsi governments. El-Sisi’s military regime has already arrested her twice and both time they found her acting against the police brutality problematic. Unless we stop political repression of the regime as a whole, such release may only be temporary for the brutal regime can always jail anyone they want. Despite such acts of political vengeance and violation of basic democratic rights, the leaders of world countries are not showing any sincere reaction against it. The United States occasionally talks about human rights and democracy but Egypt is not only exception to them but US is even providing arms and money to Egypt regime. President of South Korea, Park Geun-Hye, also recently wrote a letter of amity to El-Sisi saying that she hopes “to increase mutual understanding based on the sound trust between the two nations”. Surely all of them are hypocrites. Political prisoners, their families and local activists have called for solidarity voice over the world to raise concern about the political repression. We Korean activists are here today to respond to their call and make our voice heard. We are in solidarity with the political prisoners of Eygpt who are being oppressed for their political faith and conscience. Moreover, we will do everything possible to support the workers and people in Egypt to rise against the military regime and push the history forward. Join the international solidarity actions for political prisoners in Egypt on 20-21 June. Read more about planned protests here and on our Facebook page.